Entertaining for a crowd, but forgot to thaw the chicken wings? No worries you can make my easy recipe for Instant Pot Chicken Wings from Frozen in about 30 minutes time! The big game is this weekend. How can that possibly be? 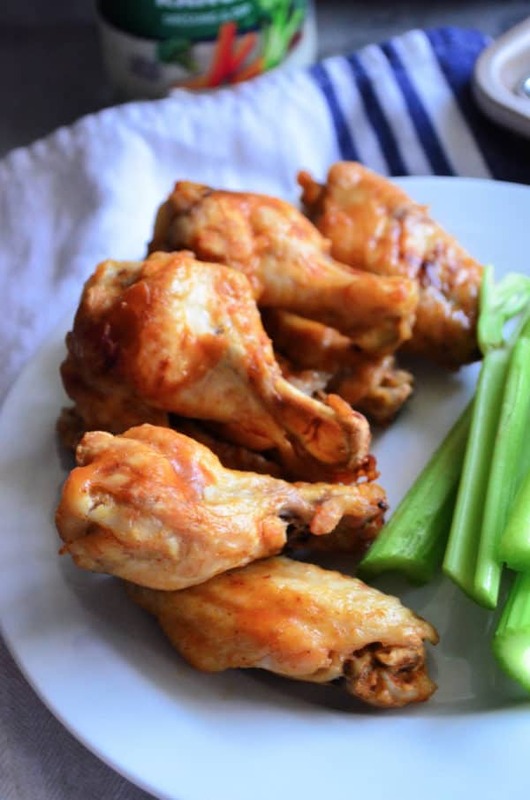 Whether your staying in or heading to a friends house my Instant Pot Chicken Wings from Frozen recipe is going to have your crowd cheering for more! My husband told me these were the best fall-off-the-bone wings he has ever had (and he has ate a lot of chicken wings in his young lifetime). I’m diving deeper with my love for my Instant Pot this year and working on quite a few “basics” recipes. I figured why couldn’t I cook chicken wings in the Instant Pot? Even better–from frozen. So I tested, and tested again and well they came out just about perfect every single time. You could serve them right out of the Instant Pot; however, I like to put them under the broiler for a few minutes to crisp the skin. The results give you the same great taste as a fried wing except they are much more tender! Fall off the bone, to be exact. I toss my chicken wings in Franks Buffalo Sauce, but you can use barbecue, teriyaki, a little lemon garlic marinade or make your own. The sky is the limit! 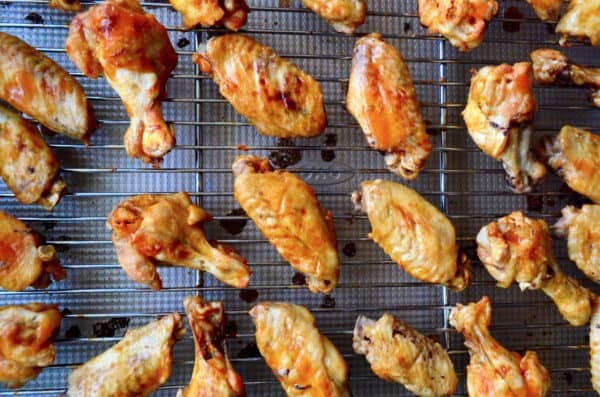 What do you need to cook chicken wings in the Instant Pot? Here is what you will need to make Instant Pot Chicken Wings. How do you cook chicken wings in the Instant Pot? The key to making frozen chicken wings in the Instant Pot is to make sure they aren’t frozen in one big block. They need to be individually frozen. I buy a 2 pound bag from Earth Fare and they are individual pieces. Perfect for this recipe. First, you’ll want to place the trivet that comes with your Instant Pot inside the Instant Pot. Then add water. Carefully stack the wings on top of the trivet trying to make sure that none touch the bottom. Spoiler alert: I had a few fall to the bottom and they still came out fine. Next set your Instant Pot to cook for 12 minutes. Then, let it naturally rest for 5 minutes. While the wings rest, spray the wire rack with cooking spray then set on top of a baking sheet. Preheat your oven to a high broil. Carefully, force pressure after the 5 minutes is up. Transfer to a bowl with sauce of choice. Mix well (carefully because they will practically fall off the bone), then, using tongs, place on to a sprayed wire rack. Once all the wings are on the rack place in the oven for 3-5 minutes until golden. Remove from the oven, flip every wing over, and repeat until the other side is golden in color and crispy. Remove the chicken wings from the oven, plate, and serve with your favorite ranch or bleu cheese dressing, carrot and celery sticks! Within a half hours time you’ll have the most amazing fall-off-the-bone chicken wings! Looking for more game day snacking recipes? Here are a few of my most popular/my favorites that I love to serve during sporting events! Whether it’s just you and your partner or a crowd full of friends and family. Don’t stress if you forgot to defrost the chicken wings! 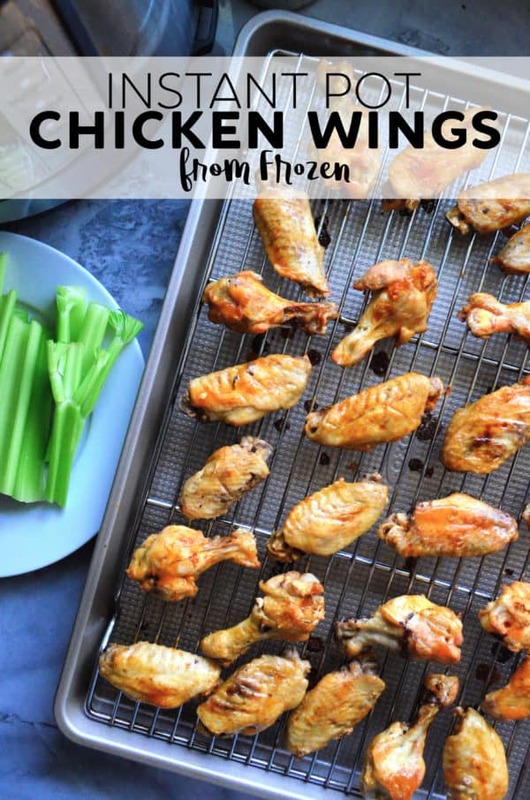 Embrace it and your Instant Pot and make my Instant Pot Chicken Wings from Frozen! Place the trivet into the Instant Pot. Carefully stack the wings on top of the trivet trying to make sure that none touch the bottom. Select "Manual" and cook for 12 minutes. Then, let the IP naturally rest for 5 minutes. While the wings rest, spray the wire rack with cooking spray then set on top of a baking sheet. Preheat your oven to a high broil. Carefully, force pressure after the 5 minutes are up. Transfer to a bowl with sauce of choice. Mix well (carefully because they will practically fall off the bone), then, using tongs, place on to the sprayed wire rack. Once all the wings are on the rack place in the oven for 3-5 minutes until golden (watch them carefully to ensure they don't burn). 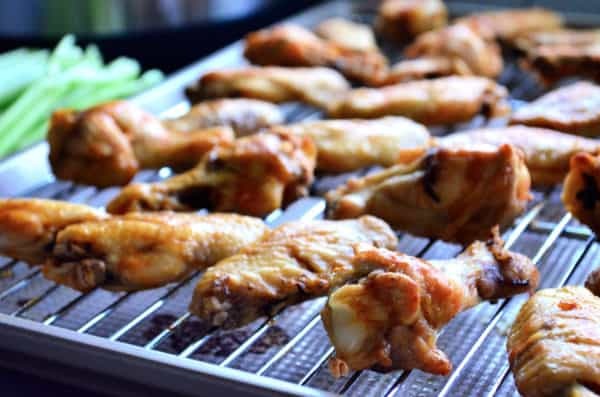 Remove from the oven, flip every wing/drum over, and repeat until the other side is golden in color and crispy (about 3-5 minutes depending on your oven). Remove the chicken wings from the oven, plate, and serve with your favorite ranch or bleu cheese dressing, carrot and celery sticks! *Save additional sauce and re-coat wings after you've pulled them out of the oven OR serve on the side with the wings. Disclaimer: There are affiliate links in this post. That means if you click on a link and purchase something I will receive a small percentage of the sale at no additional cost to you!